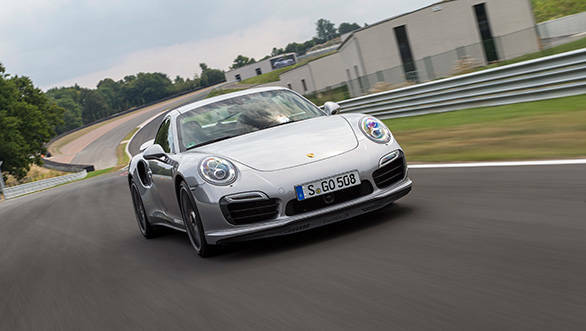 There is no way to find out just how fast the 911 Turbo S is flying down the back straight of the Bilster Berg circuit. It's a fairly long straight, but it has one nasty dip and two wicked humps in the middle that can upset any car. Override your mind that's sensibly telling you to back off the gas pedal for an instant, and instead jam it in all the way to the floor pan to experience a minor eruption in your loins. The 0.15bar over boost available exclusively in the Turbo S for just 20 seconds kicks in so viciously that if you thought the car was traveling quickly already, the unexpected surge of speed will shock you. That overboost from the twin-turbos is just sensational and shoves the Turbo S from 0-100kph in a claimed 3.1 seconds. This makes it the quickest 911 ever. Quicker even than the GT3, the GT2 RS and the homologation version of the Le Mans-winning GT1. I am in the centre of Germany to be introduced to the 911 Turbo and Turbo S at a unique drive resort called the Bilster Berg that was the brainchild of Count Marcus Graf von Oeynhausen-Sierstorpff. The Count also owns a massive estate just twenty minutes away from the circuit, which has been converted into a park and a hotel. So while you wind up at the circuit, the resort is a pleasant place to unwind. The estate is the perfect picture of serenity and calm, but Bilster Berg is this tempestuous and freakishly imaginative racetrack. It has to be one of the most technically demanding circuits there is in Europe, a mini Nordschliefe if you must. The incredible range of elevations, the maddeningly tight corners, the ominous chicanes with their gigantic sausage-like kerbs very easily incite fear the first few laps out. The flow of the circuit is incredibly quick; you have literally no straights connecting two corners to catch your breath. It flows from one corner to the next rapidly with a massively steep downhill decreasing radius left corner, which is also off camber and makes Laguna Seca seem like an unscrewed cork! Bilster Berg is a brilliant place to test any sports car and makes it ideal for the new 911 Turbo S, which in itself is a massive leap forward compared to its predecessor. 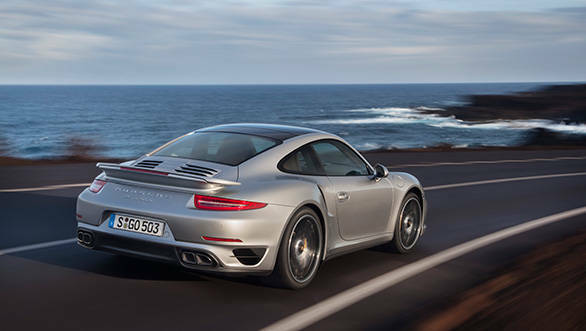 The 911 Turbo grabs headlines with its new rear wheel steer system, active aerodynamics and its twin-turbo engine. That trio of features give it the pace and dynamism to make it one of the most mental 911s to come out of Zuffenhausen. I had a whole day with the Turbo S and it is clearly poised to take on the Ferrari 458 Italia and the Nissan GT-R, obvious references to which could be heard from each and every scribe present at the event. Porsche even claims that the 911 Turbo S busts the famed north loop of the Nordschleife in 7 minutes and 27 seconds on standard production tyres, and drops another 3 seconds using performance tyres. The only thing missing, a standard roll cage! The rear wheel steer system isn't new, and several other manufacturers have employed it in everything from everyday saloons to sports cars. Yet, for Porsche this is a first, and it brings both slow and high speed advantages to the package. The system uses electronically-controlled hydraulic actuators replacing the conventional tie-rods. At speeds under 80kph the rear wheels turn in a direction opposite to the front wheels. This tightens the turning diameter to 10.6m, making it easier to park and maneuver in urban areas. At speeds over 80kph the rear wheels turn in the same direction as the front wheels which gives it greater stability and precision. In essence this system virtually reduces the wheelbase at low speeds while increasing it at higher speeds. On a circuit, honestly its hard to make out the 2.8 degree change in rear wheel angle, and neither is this visible to the naked eye. What you do experience however, is a tighter line through any corner and the absolute lack of understeer. The 911 Turbo S is like a big fat go-kart! Throwing it into corners too early at a fairly high clip and then dialing in more steering lock to avoid going beyond the kerb on the exit, you're constantly thinking "now comes the understeer, here it comes, almost there, nearly there." But the tyres don't protest, not one bit and you make it through the corner with surprising alacrity. You expect the 911 Turbo S to understeer, but the almost indignant lack of drama is highly unsettling. You expect some defiance to the laws of physics, but by just ignoring them completely, the sheer audacity of the 911 Turbo S is alarming. The next lap you come in harder and the next even harder and all the time the 911 Turbo S is spellbindingly poised as you attack corner after corner at massive turns of speed. A unique feature exclusive to the 911 Turbo S is the adaptive aerodynamics package. This utilises a front spoiler made entirely of a hard rubber and a rear slotted wing, both of which are deployed in three stages. At speeds of up to 120kph, the front and rear spoiler stay inactive, but as speeds increase, the front spoiler is initiated in two of three parts by an innovative air bellows system. The rear spoiler also extends itself 25mm upwards above 120kph and up a further 50mm in performance mode activated by pressing down the Sport Plus button. The front spoiler also extends fully and this generates 132kg of downforce, especially at its top speed of 318kph, and also reveals the Turbo nameplate embossed on the front spoiler. How cool is that? Pushing the 911 Turbo S to its limits around the Bilster Berg, it's obvious that the spoilers play a huge part in its razor sharp and precise dynamic abilities. The lack of understeer can be attributed to that immense downforce forcing the front wheels to stay true to the intended line. Yet, that is not all that's making the 911 Turbo S corner the way it does. 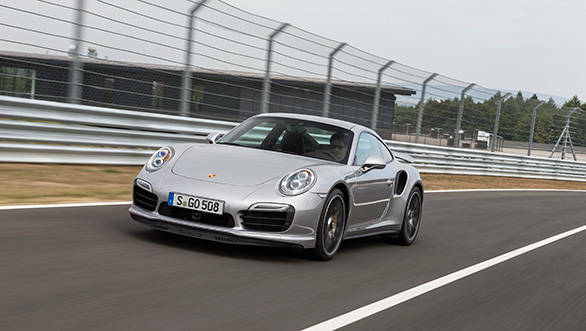 The 911 Turbo S has a standard 4-wheel drivetrain and the torque bias can shift a 100 percent between front and rear wheels depending on the driving situation. Combine the rear wheel steering system and the Turbo S gets even more agile than the Carrera 4S, which I recently drove in India. The 911 Turbo S has a 100mm longer wheelbase and a wider track than the Carrera it is based on. This new geometry and a lower centre of gravity along with the above mentioned driving aids makes this the sweetest handling Porsche in the entire range. Porsches have traditionally always polarized opinion; there are people who find them extremely intimidating and believe that taming one separates the men from the boys. But there are other Porsches that have also been beautiful to drive. The 911 Turbo S finds itself straddling both diasporas. It can be absolutely mental one instant but smoothly transitions into a charmer the next. 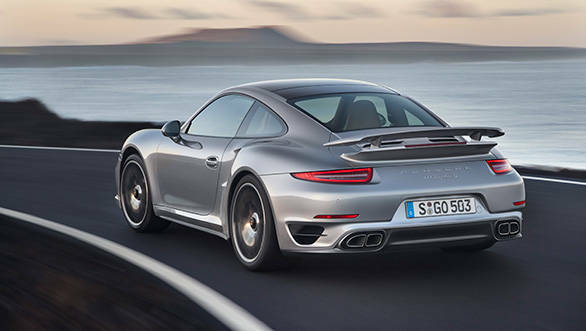 The 911 Turbo S has such wide limits that even your grandmother could drive one of these, without losing her dentures. A revised 3.8-litre six-cylinder horizontally opposed direct injection twin-turbo charged engine can be found at the rear of the car. This engine is quite easily capable of filling all the blanks you've ever experienced in a supercar. The 3800cc mill uses an all-aluminum architecture to generate 560PS of max power and a mind numbing 710Nm of max torque. This clearly makes Porsche's 6-cylinder vastly superior to the firepower assembled in the FSI V8 or V10 Audi R8, the Ferrari 458 Italia and even the 2012 Nissan GT-R.
More than the power though, it's the impressive amounts of torque that this engine generates that boggles. The two turbochargers employed to generate that torque use variable geometry turbine technology which allows the torque to peak at just 2100rpm and staying available right to 4250rpm. Compared to the outgoing model, power has been hiked by 20PS while torque has gone up 10 Nm. However, the Turbo S also gets an overboost function courtesy its standard Sport Chrono package, which bumps torque to an astronomical 750Nm available between 2200rpm- 4000rpm. The overboost function increases charge pressure by 0.15bar over the existing 2.0bar for a maximum of twenty seconds. I know I am repeating myself, but the sensation of that overboost kicking in makes the Porsche 911 Turbo S feel like a bullet exiting a muzzle. It's a pure burst of speed and gives you an idea of what KERS must do in an F1 car. 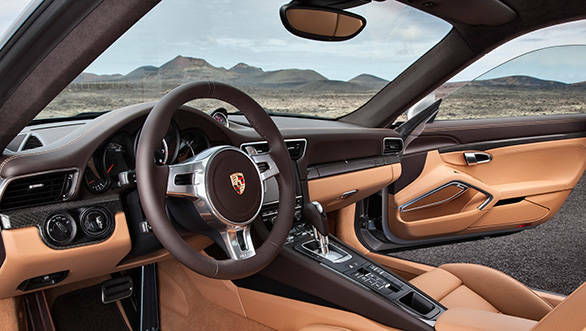 All that torque is distributed to the four wheels through Porsche's PDK semi-automatic, dual-clutch transmission. Torque vectoring further aids the distribution of torque to the correct wheels and a launch control system allows a 0-100kph time of 3.1 seconds. 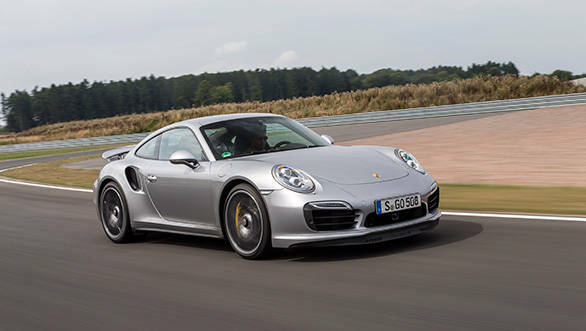 The 911 Turbo S builds acceleration stupendously. It's so, so fast you are left catching your breath and realigning your wits to prepare for the corners that come up quicker than you expected. It's incredible turn of speed isn't accompanied by the typical Italian savagery, you don't hear the gearbox crack into every gear or the brutal kick in your back every time the torque hits the driven wheels. The 911 Turbo S is so incredibly linear. 0-200kph seems like one big tidal wave, and there is barely any perceptible nudge every time the transmission shifts gears. And left in automatic mode, the engine feels seamless. You see only the rev counter in front of your eyes, not the speedo, and watching the tacho hit its 7200rpm redline with machine gun tempo or the G-Force meter with its ball bouncing all over the screen can be distracting. The only two issues I had with the 911 Turbo S are the ingress and egress. This is a difficult car to get in and out of because its perched low. Yet, the Cayman S I drove recently felt like you needed a much more flexible body to contort in and out of the driver's seat. The other issue I had with this car is the lack of an adequately inspiring soundtrack. The exhaust has been engineered to make a sound, it's just not Hans Zimmer's rising octaves for the Dark Knight! For once, I found myself not needing to turn down the volume on the sound system to listen to the exhaust note. Terribly disappointed by the lack of a complementary audio track! I can't remember the last time I wanted a car this badly. The 911 Turbo S is a masterstroke, an everyday car but also super on every occasion. It will be launched in India shortly and I think there will be a few complications, especially that front spoiler which will simply disintegrate on our roads if you take the speedo above 120kmph. That means this car will be best sampled on a racetrack. As for pricing, its definitely going to be more than a crore. In fact, several lakh more than the Rs 1.61 crore the car commands right now. If it were up to me though, I'd definitely ignore the pricing because there is also a lot of equipment as standard in the Turbo S, such as the carbon ceramic brakes, a Burmester sound system, radar-based adaptive cruise control, adaptive LED headlamps with cornering ability and a whole lot more gizmos. In fact, despite Porsche's best intentions, they were unable to reduce the weight of the car because there are just so many luxury trappings still in there. Hard to imagine then, that despite the impressive kit and just a 6-cylinder engine, this car is completely bonkers when you floor the gas pedal. The Porsche 911 Turbo S then may not be as flamboyant as a Lamborghini Gallardo, or seductive as a Ferrari 458 Italia but if you are seated in them, the only view of the 911 Turbo S you will have is of its tail lights.